Not all studying leads to the same results. This is because study skills need to be worked on in order for them to be effective. If you've noticed that your child studies for tests but never gets the results they're after, they may need to reconsider their study strategy. The following tips may be able to help. 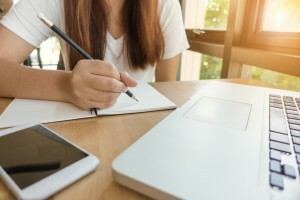 Technology is great for many things, but when it comes time for a student to study, technology may actually get in the way. Your child may be getting notifications from their cellphone and tablet constantly, which means they won't be able to pay attention to the notes in front of them long enough to actually take it in. Because of this, it's best to make their study area a tech-free zone unless they absolutely need some technology to study. The sounds of you vacuuming in the next room or the television in the living room can be enough to cause your child to lose their focus. Do your best to keep your home quiet during the hours you know your child will be studying. This quiet environment will make it easier for them to absorb their lessons. Not having enough time to study is something that often leads students to perform below their abilities on a test. To prevent this from happening, have your children study daily. Even if they don't have a test coming up yet, they should still make time to review their lessons and go over their notes every day. This will ensure they're better prepared for when they do have a test coming up. Students who need a bit more academic support to reach their academic goals can benefit from enrolling in tutoring in Chester. The Tutoring Center, Chester NJ offers a number of different academic programs that your child can benefit from. Give them a call at (908) 888-2199 to learn more.